In the first half of the nineteenth century it was traditional for the Oxfordshire villages of Hailey, Crawley and Witney to celebrate Whit Monday with a hunt at Wychwood Forest. Whit-horns were made of softened willow bark in the weeks leading up to the celebrations, and played at dawn to wake the village for the hunt. 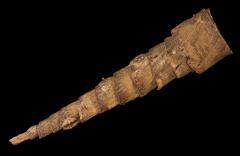 Formed from strips of willow bark wound into a funnel, the horns were secured with hawthorn or blackthorn spines, the whole measuring around 18" in length and 4" across the bell. 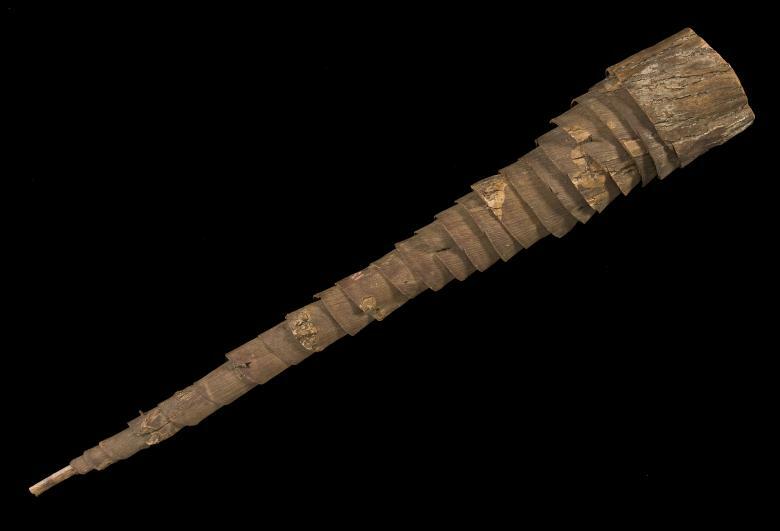 Bark was inserted into the narrow end to form a reed, with the mouthpiece pinched together around it, hence Henry Balfour, the first Curator of the Pitt Rivers Collection, described the entire as a 'primitive oboe'. The whit-horns in the Pitt Rivers collection (1895.21.1, 1903.130.22.1 and 1903.130.22.2) were donated by Henry Balfour, but were collected by Thomas Carter. They were made in the 1890s - half a century after the last Whit hunt (at the enclosure of the forests). Their maker was an anonymous local man, who had made similar instruments for the hunt in his youth. Percy Manning, a contemporary and probably acquaintance of Balfour's, also collected a whit-horn, which was made for him by John Fisher in 1895. It is likely that he shared his contacts with Balfour and that Balfour's instruments were made by the same man. The following section will discuss some of the issues surrounding Balfour's methods of collection and his analysis of the instrument. These items came into the Pitt Rivers as a result of the work of museum curator, Henry Balfour (1863-1939), and independent collector Thomas Carter (b.1832). As the first Curator of the Pitt Rivers Anthropology Collection, Balfour sought to find out more about the objects in the Museum, as well as to augment the collections. He thus employed 'fieldworkers' such as Carter and encouraged friends to contribute, as well as finding, researching and writing about the items himself. In his article, A Primitive Musical Instrument (1896), Balfour pursues two key themes, both typical of the Victorian mindset and indicative of the themes emerging in the fledgling discipline of anthropology. First, in describing the whit-horn as a 'primitive oboe', Balfour not only explicitly establishes its simple nature, but also links it to the modern oboe: an instrument then considered to be at the pinnacle of western musical development, the very opposite of primitiveness. Typical of the Darwinian era, and in accordance with General Pitt-Rivers' own ideology, Balfour develops the notion that the one might have evolved from the other. Balfour's second theme is to establish the whit-horn and its use as a relic of ancient society, only salvaged from history as a result of his efforts. Thus his article explains that use of the whit-horn had for years been a popular tradition and even continued for other purposes for a few years after the forest enclosure of the 1850s, but that the custom was now 'almost obsolete'. Interestingly however, Balfour's concern is not historical, but scientific: Balfour's entire purpose is to shed light on the evolution of culture. As a consequence his approach is comparative and includes a reference to Naumann's research on the 'May flute' found among peasants of the lower Rhine, as well as referring to objects collected in India, Burma and China. The words 'primitive', 'survivals' and 'evolve' recur throughout the work and the article concludes with the revealing remark that, 'The whole series of developmental stages can, in fact, probably be illustrated by means of modern survivals in various countries.' The evolutionary ideology behind his work is therefore clear, and matches the contemporary attitude of the institution that employed him. It is plain from his writing that Balfour's interest was academic rather than personal, focused on the material and evolutionary links to similar objects rather than on the people who used them. That Balfour includes so few personal or anecdotal details is surprising considering that his hired collector, Thomas Carter, no doubt supplied the same detailed information and vivid descriptions to him as are preserved in the notebooks of Percy Manning at the Bodleian Library and published by Manning in his article, 'Some Oxfordshire Seasonal Festivals'. The disparity between his publication and that of Balfour can be explained by the different factors motivating these collectors: whilst Percy Manning was primarily a historian, interested in seeing how people once might have lived and what objects they might have used; Balfour was a scientist interested in the evolution of material culture , rather than in the people who created and used these objects. Thus instead of pursuing a historical example of a whit-horn from the period of its use, Balfour is content to commission replicas - so long as their maker can be considered 'authentic'. It is for this reason that Balfour makes it clear in his article that the maker (who, revealingly, remains anonymous) is 'a very old man of the district, who well remembered their use and mode of manufacture' from making them for the hunt in his youth. Manning, P. 1993 (c.1890-1910). Folklore Collections by Correspondents of Percy Manning . MS Top.Oxon d. 192. 415 exp. __________ 1993 (c.1890-1910). Collections on Morris Dancing and Whitsuntide Celebrations in Oxfordshire . MS Top.Oxon d. 200. 290 exp. __________ 1993 (c.1890-1910). Collections on the celebration of seasonal feasts in Oxford University, City and County: and on mumming . MS Top.Oxon d. 199. 393 exp. __________ 1993 (c.1890-1910). Collections relating to Oxfordshire village life in the 19 th century . MS Top.Oxon d. 193. 158 exp.